↑ "Kangaroo population estimates". Government of Australia: Department of the Environment. Retrieved 27 October 2014. ↑ "Coat of arms". Department of Foreign Affairs and Trade. Australian Government. Archived from the original on 28 September 2011. Retrieved 2 October 2011. ↑ "Our currency". Department of Foreign Affairs and Trade. Australian Government. Archived from the original on 28 September 2011. Retrieved 2 October 2011. ↑ "The Kangaroo Symbol". Qantas. Archived from the original on 14 April 2006. ↑ Air Force. "RAAF Ensign and Roundel". 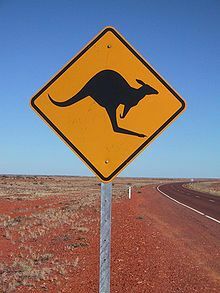 ↑ "Kangaroo Industry Background Kangaroo Industries Association of Australia. July 2008". Kangaroo-industry.asn.au. 31 July 1997. Archived from the original on 5 February 2009. Retrieved 5 April 2009. ↑ Dow, Steve (26 September 2007). "An industry that's under the gun". Sydney Morning Herald. Fairfax Media. Retrieved 2 October 2011.